Dealing with hunger on a daily basis can be exasperating. There is nothing worse than being hungry half-an-hour after a meal and knowing that there are a few more hours to go before it’s time to eat again. This is why it is very important to do what you can to curb hunger by feeding your body foods that take longer to process, and don’t cause spikes in blood sugar. Protein gives us the energy to get up and go—and keep going. Amino acids found in protein are the body’s basic building blocks for growth and energy, and essential for maintaining cells, tissues, and organs. Without them, your human machine could grind to a halt. Protein is all around us. Most people don’t have trouble getting enough protein. The question is: Are we getting the right protein? There are many sources of protein, but all are not created equal. The type of protein you eat plays a key role in successful weight loss and in your overall health. 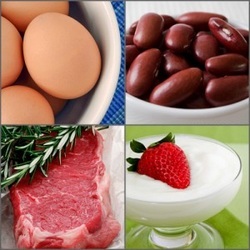 Focus on quality sources of protein that are low in fat, but high in the proteins that the body needs. Whether or not you are a vegetarian, the healthiest approach is to choose from a variety of protein sources. Fish: Offers heart-healthy omega-3 fatty acids and, in general, less fat than any other protein source. Poultry: Unbreaded, skinless white meat is another excellent source of healthy protein. Lean Red Meat: Full of protein, but can be loaded with unhealthy saturated fat. The healthiest choices are those with 10% fat or less. Sirloin steak, and 10% lean ground beef is better than a roast for getting what you need. Low Fat Dairy: Milk and other dairy products contains protein and vitamin D, which is instrumental in using calcium in the body. Calcium is needed by the bones but also the muscles for growth and fiber production. Eggs: Also abundant in protein, although they also contain dietary cholesterol, which can raise the risk of heart disease in people with elevated blood cholesterol levels. Chose egg whites over the yolk as much as possible. Whole grains: A slice of whole wheat bread, gives you 2 grams of protein, plus valuable fiber. Beans, nuts, legumes, and soy products: These plant-based proteins often contain the same amount of protein as meats. Plus, they're loaded with fiber that helps you feel full for hours. Some studies suggest that plant-based proteins are even healthier than those from animals. Make your breakfast oatmeal with milk instead of water. Take yogurt with you to the gym and enjoy it as a post-workout booster. Snack on fat-free mozzarella cheese. Try smoked salmon or one of the new lean sausages for breakfast. Take along a hard-boiled egg for an easy snack. Munch on nuts at meals and snacks. Choose round or tenderloin cuts of meat. Try swapping carbs with a little bit more protein to see and feel the difference. Start each meal by eating the protein on your plate before you eat the carbohydrates, you will not only make sure you get the protein you need, and “fool” your stomach into feeling full on protein first, so you will not want as many carbohydrates before you meal is over. So How Much Protein Is Enough? Because our bodies do not store protein, it’s important to eat protein everyday to maintain a healthy body. However, our bodies need only a modest amount of protein to function well. Like anything….. too much can be a bad thing. Overtime, too much protein can cause harmful damage to the vital organs of your body. So how much protein is enough? Teenage boys and active men can get all the protein they need from three daily servings for a total of seven ounces. For children age 2 to 6, most women, and some older people, the government recommends two to three daily servings for a total of five ounces. For older children, teen girls, active women (or those who are pregnant or nursing), and most men, the guidelines give the nod to two to three daily servings for a total of six ounces. Another way to count protein requirements is as a percentage of calories. The USDA's MyPyramid plan suggests that protein make up between 17% to 21% percent of total calories. So if you are trying to lose weight or just remain healthy, including enough healthy protein in your daily diet is key to your dieting success. Check out some of my favorite protein recipes from the links above!